So you’ve played Mega Fortune: The original, now let’s explore the latter edition to NetEnt’s fabulous Progressive jackpot duo, the sequel if you like: Mega Fortune Dreams. This whole site is dedicated to what we called ‘Millionaire Makers’ and Mega Fortune Dreams is No exception. Mega Fortune Dreams was released mid-2014 to carry the torch of popular predecessors Mega Fortune. The main difference between the 2 is mainly the design, Mega Fortune Dreams is far softer and echoes Caribbean azures and tropical holidays. Mega Fortune Dreams is an enhanced version of the original Netent jackpot slot Mega Fortune and boasts animated Wild and Scatter symbols and has special game features such as Free Spins, Multipliers, Re-spins and what’s really interesting: The 3 different jackpots that you can win in the Bonus Game. Let’s get started: Mega Fortune Dreams is designed with 5 reels, 3 rows and 20 fixed bet lines. Set the slot which is best for your own casino playing style and in your comfort zones for the most enjoyment. The bet levels go from 1 to 4 on the 20 bet lines. There are also 7 different coin values, ranging from €0.01 to €1.00. To calculate the minimum and maximum bets, use this as a guide: Bet Level 1 x 20 bet lines x coin value €0.01 = €0.20 and the Maximum Bet being: Bet Level 4 x 20 bet lines x coin value €1.00 = a whopping €80! There are some exciting extras and bonus rounds in this progressive slot to keep you truly entertained while you aim for the Mega Jackpot. 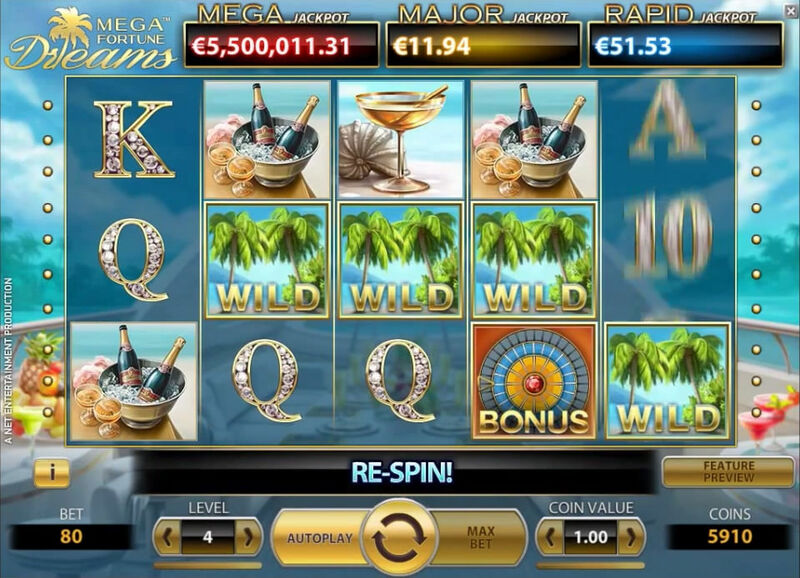 Mega Fortune Dreams Wilds, Re-spins and Multipliers: Mega Fortune Dreams have Wild symbols which you can pick out as they are waving Palm Trees. These wilds will substitute for any other symbol (except for the Scatter symbols and Bonus Game symbols) to create the highest possible winning bet line for you. The Wild Symbols can appear on any reel, both during the main game, during re-spins and also during the Free Spin mode as well. What’s more, the winnings of a winning bet line which has been created with one or more Wild symbols will be multiplied x 10 as well! Already you’ll notice there’s many chances to win big with Mega Fortune Dreams. Also, when 3 or more Wild symbols appear during the main game - then 1 re-spin is granted to you. During the re-spin, the substituting Wilds will remain in their existing position, with the Re-spins then activating both the Free Spin mode as well as the Bonus Game, which is where you exactly want to be! Not however that it´s not possible for both features to be triggered during the same re-spin. Free spins, Multipliers and Scatters: When you land 3 or more Scatter symbols (Spinning Diamonds) appear anywhere on the reels, the Free Spin mode is activated. When you get 3 Scatters, you’ll be awarded 10 Free Spins, Get 4 Scatter symbols and you’ll get 15 Free Spins and lastly, manage to get 5 Scatter symbols to be awarded 20 Free Spins. Any wins during the free spin mode will also be multiplied by 3 so that’s a nice end to that free spins round isn’t it? How to get to the Bonus Game and the Jackpots: Now here comes the really exciting part of the game: How to get a chance at winning the Mega Fortune Dreams Mega Jackpot! So, to get a shot at winning the jackpot, you need to look out for 3 or more Bonus Game symbols which you’ll instantly recognise as they look like mini- Wheel of Fortunes. Get these appearing on a bet line and the Bonus round will open up! If you get to the bonus round, either a fixed coin prize can be won or one of the 3 progressive jackpots can be yours too! 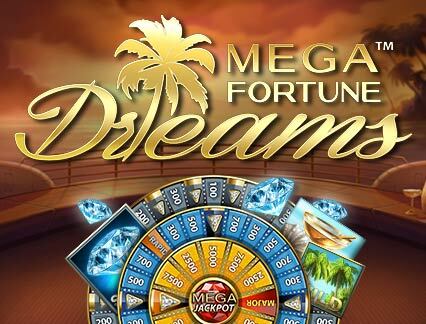 Mega Fortune Dreams has 3 main progressive jackpots: The Rapid Jackpot, The Major Jackpot and the big Kahuna: The Mega Jackpot. The Bonus Game in Mega Fortune Dreams is much like the original Mega Fortune Bonus round: It features a spinning “Wheel of Fortune” which is built from 3 separate rings. The idea here is that you spin the outer ‘wheel’ and when it stops, the pointer will indicate what prize you win. If the pointer points to a jackpot symbol however, this is very good news for you as it means you will make it to the middle ring, which is one step further towards the Mega Jackpot. If you enter this ring, you will either win a prize of the jackpot associated with that ring, and of course if you get the jackpot symbol you can continue to the inner ring, the last right where you can have a chance at winning the mega Jackpot. Player enters either the next ring (with bigger prizes and to be won) or wins the jackpot of that ring. Prizes on the Wheel of Fortune:The first outer ring has only arrows or coin prizes of 20, 40 and 60 coin wins. What you really want here is a pointer which points you to the next wheel. The second ring is home to the Rapid Jackpot, and also has prizes 60, 100 and 140 coins, and 2 Rapid Jackpot symbols, which you will win if the pointer is pointing at one of these symbols plus, if you have your eyes set on a win bigger that the rapid jackpot, then aim for one of the 4 arrows that will lead to the next Bonus Game round. The third ring is home to the Major Jackpot and also has 10 prizes of 500, 1,000 and 1,500 coins, just the one Major Jackpot symbol that will grant the Major Jackpot to you (yay!) if the pointer stops on that very icon and the just the one arrow that will lead to the centre of all of the 3 wheels, where you will win the Mega Jackpot of Mega Fortune Dreams! Every jackpot is different amounts and never the same as all prizes are pooled from participating casinos and can be won at any time, but the Major and Mega Jackpots have average pay-outs of approximately €75,000 and the Mega Jackpot at €3,750.000. Of course Mega Fortune Dreams is available to play any time and anywhere. With a slot with this caliber, NetEnt have done a fine job in making it totally accessible on desktop, tablet and mobile phone on most main platforms. You can try and aim for the mega jackpot anywhere you are. The Mega Fortune Dreams mobile slot comes in the form of Mega Fortune Dreams Touch version, and loses no appeal or features from the main desktop version. Mega Fortune Dreams is perfect to play on your iPad, as this is where we prefer to play our online slots, but the choice is yours! Mega Fortune Dreams is a great following up to NetEnts original Mega Fortune Progressive slot. Of course as with any new version of a casino slot, expect to see sharper graphics, better icons soundtrack, but we have to agree that this slot is a better edition as we found it more comfortable to play – mainly down to the colours. How simple is that? But of course it does come down to personal choice. Well, whatever you prefer, whether it be the original Mega Fortune or you’re like us, and really like to play Mega Fortune Dreams – next time you play online casino think about trying one of the mega fortunes for massive win possibilities you have 2 brilliant jackpot slots there for the taking. Enjoy!